David Nash’s “Boulder”, I used to have a vague idea as to where my life was heading, and then suddenly I was lost. “What song” questions are cruel, man. I was punk once, guess I would have had a good song for world conquering on my playlist then. I’m quiet these days though and if I really gotta take something on, I look to caffeine. I’ve got Leif Vollebekk’s ’North Americana’ album playing today, not so much for taking the world on as it is for keeping it at arm’s length. Probably watching “Stand By Me”. I’d talk about how I’d like to see us reconnecting ourselves with material. Industrialisation and consumerism have given us so many wonderful things but I do feel like we’ve allowed ourselves to become detached from how they came to be. Unless you’ve got an ethical axe to grind it’s rare these days that we look at a material and think of the source, it’s easy to look at a piece of furniture for example and just think of wood as being its own substance, and not acknowledge that it was once a tree. Likewise I’d be surprised if many people look down at their shoes and ever think of cows. Whether natural or synthetic, food or function, I think appreciating the process of how things come to be, even on a simplified level, would help us better appreciate the objects we have around us and avoid taking their sources for granted. Always fancied myself as a nature photographer for Nat Geo or something, time in vast expanse seeing the planet at its most impressive. Remember when we were kinds and a fiver in your pocket was like the world in your hand? My phone, not for making calls though obviously. I’d like to say a Lucie Rie pot or something but even if I owned one it would still be my phone.ng. There was a period a few years back where I was reading a lot of books and watching a lot of documentaries which were on the same tip, my way of thinking was already changing so I was looking for things which would nurture that. If you’re conscientious about the environment or trying to run a responsible business the reading material isn’t particularly fun or light hearted, but “Let my people go surfing,” (the memoirs of Patagonia founder, Yvon Chouinard) is a little more inspiring and hopeful. The California Redwood Forest and the Cape Byron Light. 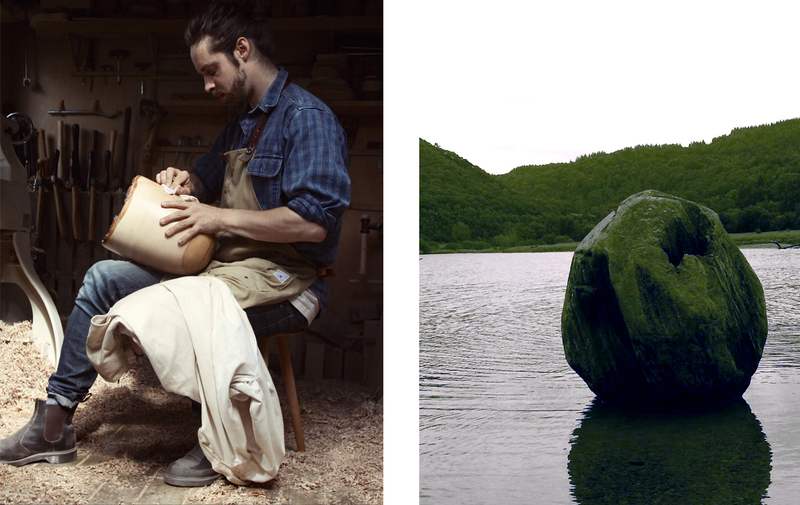 Wooden + Woven is the creation of Alex Devol. Alex has been making things his whole life, things of all forms and functions, but the materials he finds himself most at home with seem to always be wooden or woven. He believes in a simple, honest approach to design where aesthetics and utility are intrinsic. There is a distinct and individual quality in well-made, slow made, and handmade things which begins with the story of their making and continues on with each use. The pieces Wooden + Woven make are intended to be more than just utensils, they should mellow with age and make the otherwise mundane tasks of scooping, stirring & sipping handsome & homely. “When I drink coffee from handmade pottery I like to think of the clay as it was being thrown, I imagine the maker, the workshop, the mug taking shape, there is beauty which can only be achieved through making each piece one at a time”.